The Yowza Lido folding treadmill is an inexpensive version of their pricier but nearly perfect models. Listed at $1000 on their website, you can get it on sale for just $799. Yowza treadmills are backed by the engineering geniuses behind Smooth, so you can assume this is going to be a solidly built machine with precision engineered parts. You'd be right on both counts. 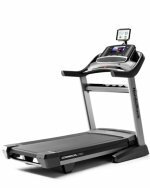 Sealed bearings and a solid hardwood deck make this company's treadmills stand-outs at any price point. The Yowza Lido folding treadmill folds into an amazingly compact upright position that practically hugs the wall; it's ideal for those with limited space. 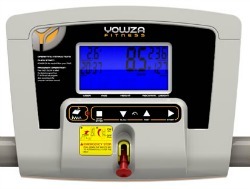 Check out the new Yowza Lido Treadmill On Sale Now! We are happy to hear that Yowza, a brand known for making affordable, top grade treadmills, has introduced the Yowza Lido folding treadmill as a budget-friendly option. This is their most basic model, and most user reviews are full of good things to say about how quiet and smooth this machine is. It's delivered completely assembled and ready to go right out of the box, which reviewers say is a big plus; no more worries about missing parts. A few people were disappointed with the lower weight limit, which at 250 pounds isn't great, but at this price point, some things have to be pared down. You can take a look at the Osprey as well, which has a 300 lb. weight limit and a few more features. Reviewers also noted that the 2.5 hp continuous duty motor is a decent size at this price point. We love the new Yowza Lido because Yowza Fitness makes one of the best brands on the market affordable for users who simply cannot afford to spend in excess of a thousand dollars or more. Like most Yowza models, it doesn't have bells and whistles like an iPod docking station or fancy graphs on the console, but these are treadmills for serious fitness buffs. 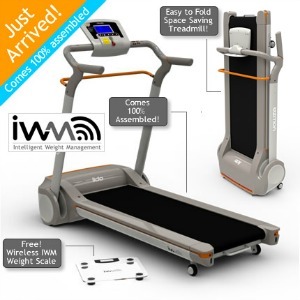 The IWM weight management system and wireless scale work together to help users create a customized workout routine, which kicks the Yowza Lido folding treadmill to the top of our list of great machines under $900. And did we mention no assembly required?